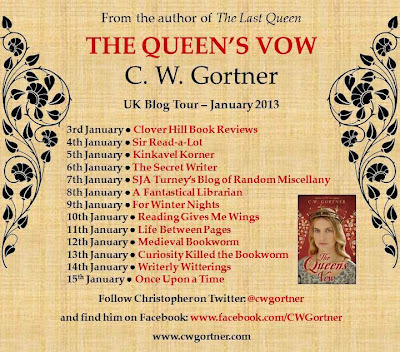 The first event of 2013 is quite special as I am handing my blog over to best selling author CW Gortner. Christopher (as I call him) is a fantastic writer whose published works have become best-sellers around the world and won him a huge following. He writes about the medieval Europe and is half-Spanish by birth, so his new release "A Queen's Vow" is close to his heart. It tells the story of Isabella of Castille, a fiercely loyal and devout Queen of Spain who was instrumental in the formation and development of The Spanish Inquisition. You can read Christopher's guest post and my review of his book on Friday January 4th! I read this novel in 2012 and thought it was excellent. In fact, it made my list of favourite reads for 2012.